It's an interesting album, just not interesting in a way that particularly compels me to listen to it again. I can't tell whether or not Matthew Herbert has run out of ideas or whether I'm dissatisfied with this disc for other reasons. If that sounds like an ominous beginning for a review, well, I'll dispel any suspense right here: There's Me and There's You is a good album, there's no denying it. But it's problematic. There's something missing. 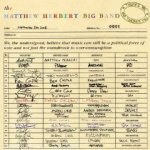 Herbert's first album with his Big Band, 2003's Goodbye, Swingtime, was an interesting, engrossing departure. For all its intricacy and dedication, it still carried the faint odor of a lark. There was no doubting the sheer virtuosity necessary to pull off that kind of crossover act -- it wasn't just jazz that was being welded to electronic music, it was big band-era swing. I can't say no one had ever done it before, but it's still not something you see very often. The album shouldn't have been any good, but it was; furthermore, Herbert shouldn't have been able to tour the world with the entire ensemble (more or less) in tow. He did that, too. But for whatever reason, after spending the first half of the present decade on a righteous hot streak, Herbert started to slow down sometime soon after Goodbye, Swingtime. There were reissues, a compilation of soundtrack music, a concept album about food that I personally loved but which probably confused most people. His last Herbert album, 2006's Scale, was good but not great, another album defined as much by its conceptual content as its tunes. Matthew Herbert is an incredibly talented and extremely conscientious musician, but the impish sense of provocation that made his earlier material so joyful seems to have waned, replaced by a dread feeling of predictable excellence. Sounds like the definition of "damning with faint praise", right? Well, it's hard to criticize an album like There's Me and There's You, simply by virtue of the fact that there's nothing ostensibly wrong with it, and it does what it does very well. But it seems as if Herbert could have released this album at any point in the last ten years. Timelessness is a virtue, but there's a fine line between timelessness and stagnation. There's a lot to like on this album. Tracks like "The Story" draw a straight line from past to new work, building atop a subtly intense groove towards a hook-filled chorus. It seems to pull equally from '40s big band -- think Nelson Riddle -- and '80s R&B. Vocalist Eska Mtungwazi reminds me of Chaka Khan, oddly enough. Her earthy presence is an interesting counterpoint to Herbert's customary vocalist, wife Dani Siciliano (who apparently decided to sit this one out, as she is M.I.A. on the album credits). The problem is that, for all the album's virtues, it nevertheless fails to cohere. There's certainly a lot to like here. Tracks in isolation can seem marvelous. For example, "Breathe" -- at seven and a half minutes long the disc's simmering centerpiece -- is dynamic. There's an oscillation between quiet-loud-quiet that creates a frisson between the more traditional jazz elements and the outré conceptual baggage. It's a fine track. But for all this tasteful decorousness, there's a decided lack of verve. Sure, Mtungwazi is a great vocalist, but she's probably a little too great -- almost a well-oiled machine, wringing every last ounce of life out of every verse. She's fighting the big band orchestra for every ounce of spotlight she can get. It's exhausting after a while. Taken as a whole, the album languishes. And that about sums it up. I can't be mad at Herbert. But his unceasing pursuit of novelty has become, well, stale. Is that paradoxical? I found my attention wandering frequently while trying to find an angle for this review. It's an interesting album, just not interesting in a way that particularly compels me to listen to it again. I suppose we should know better than to ask the ex-conservatory student to bust out of the self-imposed limitations of his own cerebral music agenda, but hey, how about some house music? He used to be really good at that.